Make sure it’s financially based. Although this is a basic principle, it is still extremely important, and many unfortunate businesses disregard this rule, only to find themselves in a failing partnership later on. The whole point of entering into a partnership is to better your company’s financial position, so your partnership should be based on the fundamental principles of business: increasing cash flow while decreasing costs. This can be accomplished through partners exchanging supplier information, adjusting inventory procedures, trading clients and customers, or collaborating on important projects, but whatever your methods, your partnership should improve your business’s bottom line. Don’t let publicity or flattery lure you into an unproductive agreement. This means that establishing an effective partnership will require you to assess your business as honestly as possible. You’ll need to evaluate your company’s inner workings, as well as your goals for the future. If your reason for considering the partnership is more accurately reflected by the latter motto, then it could be time for you to revise your business strategy. Entering into a partnership to conceal your company’s weaknesses is probably not the answer. Before any other steps are taken, it’s important for both parties to establish their goals for the partnership. Each party should clearly understand what they’re expected to deliver to the partnership, and both should know how that delivery is to be measured. Again, this seems basic, but it prevents destructive disagreements from arising as a result of one or both parties misunderstanding their responsibilities. It’s also important for you to include a termination clause in your partnership agreement, giving your company about 30-60 days’ notice to readjust to life without a partnership. This termination clause may seem counterproductive, but in fact, it actually saves many partnerships from failing before they ever get off the ground. 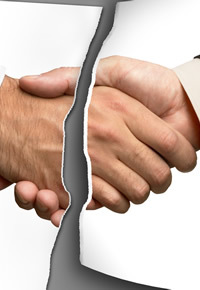 The fact is, businesses are reluctant to enter into partnerships in which they feel they’ll be stuck, but with the termination clause, both parties are given peace of mind knowing that in the event of a partnership-destroying disagreement, either one can terminate the partnership with few serious consequences. This facilitates the leap of faith required when agreeing to the partnership in the first place, and it also permits both parties to remain original and innovative throughout the partnership. Think of the partnership as a marriage: It should be difficult to walk away from because it’s mutually beneficial and it makes you happy, not because the divorce paperwork is too much of a hassle. Be careful when choosing lawyers. Lawyers are often a necessity when finalizing the partnership agreement, but in most cases, you should limit their function to just that: finalizing it. Experts say that it’s often a smart idea to consult with lawyers only after you’ve agreed to the majority of the terms of the partnership because lawyers, in general, are hard-wired to seek to expose each and every flaw in business agreements. The problem with this is that they could prevent a perfectly good deal from being carried out by highlighting every small concern. In his book The Art of the Start, Guy Kawasaki says of lawyers, “Many lawyers view their role as ‘adult supervision’ that will prevent stupid deals from taking place. However, their bias is often that a deal is bad until proven good.” If you choose a watchdog lawyer, he or she could end up causing so much doubt between parties that the partnership deal falls through. Finally, remember that lawyers are nothing more than consultants. Regardless of their opinion, no one understands your business like you do.